A friend recently commented that she can't afford to buy new clothes all the time, like I must do. Don't tell anyone, but I recycle. 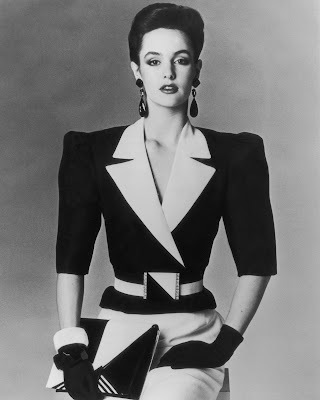 It is my belief that big shoulders were thought to make the silhouette thinner. Think about football players with their big shoulder pads and their little hips and butts. If it works for them, it should work for fashionable women. Big shoulders made a fuller silhouette look fuller and a slender silhouette look top heavy. I saved this wonderful silk knit sweater from the 80's. I saved it because it was expensive to begin with and I loved the ribbing pattern. It was also long for a sweater which, because I am tall, made it perfect. a new sweater is born! I added a long designer scarf, tied with a half windsor just for a splash of color. I'm wearing it with my winter white silk pants with the wide flared leg. Remember that this is the pant silhouette that looks good on everyone. 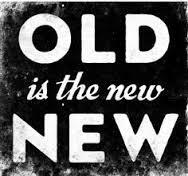 Look in the back of your closet or the bottom of your sweater drawer to see what you have stashed away. 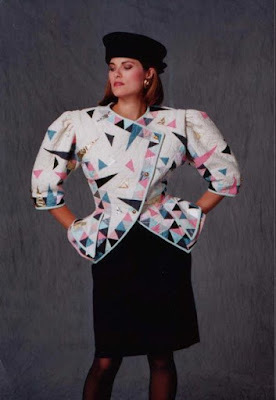 If you find an old 80's sweater, remove the shoulder pads and you are in Vogue.